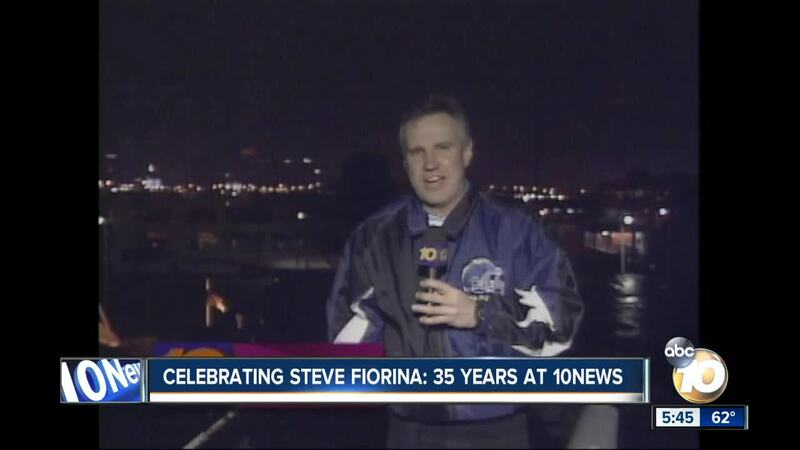 Here's a look back at some of the victories Steve Fiorina has covered during his 35 years at 10News. SAN DIEGO (KGTV) -- Steve Fiorina has been at 10News for 35 years and, in that time, has covered some incredible victories. San Diego applauded when the Padres went to the World Series in '84, facing the Detroit Tigers. And again in '98 to take on the New York Yankees. No championship rings but the Pads made it to the grand stage. The Chargers hit the pinnacle with their '94 season, Super Bowl XXIX in Miami, January, 1995; San Francisco 49ers versus the San Diego Chargers. 10News put out the word that we would simulate a road trip to Miami, flying into six cities you would pass through if driving the route. Chargers fans meeting us all along the way. People lining the street to welcome us and a massive rally at the high school gym. And the Chargers fight song rang out, too. The refrain repeated the next day in New Orleans. Final destination: Miami. A lopsided loss; 49ers trounced our guys, 49 to 26, but it was an electrifying time for Chargers fans. Every year the Padres home opener is a day-long party. Before Petco Park was built, we flew to Baltimore to illustrate the charm of Camden Yards; the template for our new ballpark. A personal thrill--seeing Tony Gwynn presented his 6th Silver Slugger award from another Hall of Famer; my boyhood baseball idol, the Cardinals' Stan the Man Musial. Last year, watching as a crowd of fans paid tribute to Mr. Padre. Tony's statue now gracing the Lake Poway Park near where he made his home. San Diego cherishes it's military; the Padres inviting and saluting our service men and women. And who can forget the pageantry of Opening Day at Del Mar Racetrack? Comic Con is magnificent! Almost a week of fun and fantasy every summer. Let's go back to 1985, when the Christian Emergency Relief Team out of Carlsbad invited us along on a mission of mercy. Flying to Honduras, along the border during the Nicaraguan War. These Angels of the Jungle built a hospital and treated these fragile refugees. There are angels out in force every spring at the Embarcadero Marina Park North. The Celebration of Champions honors the doctors and nurses at Rady Children's Hospital and raises the spirits of hundreds of children and their families fighting to live healthy, happy lives. Sports figures and media types running with these champions and honoring those tearfully paying homage to the ones who've passed. It's an emotional day. 4th of July is a blast! Thousands descend on Scripps Ranch each year. Snow Summit was a bit colder but a fabulous time as well. Finally we remember a little Lakeside girl: an Angel in Heaven, Hero on Earth, Forever in our Hearts. Kiera Larsen was ten years old when the family SUV began rolling down the driveway toward her playmates. She ran over and pushed two younger friends to safety but was crushed to death herself. Kiera was recognized with a Carnegie Hero medal and a personal letter from then President Barack Obama. We celebrate Kiera.